The outbreak of war in August 1914 was followed by a rush of enthusiasm as men joined up for what was believed would be a short conflict. Rallies were held around the country recruiting volunteers for the army. For a fashionable area like Marylebone with many shops, small businesses and hotels, the impact of losing so many young men, together with a downturn in the retail economy, was quickly felt. Tenants repeatedly reported loss of income; requests for rent reductions increased and building work was put on hold. As the war dragged on and conscription was introduced, many shops and businesses struggled to remain operative. Recruiting the men of Marylebone on a rainy day in Regents Park, 1914. Kitchener’s Army in training at Regent’s Park, summer 1914. An entry in The Portman Estate Minute Book February from 1917 records names of those serving in the forces (10 men) and those left in the estate office. As the war progressed, the need for military equipment and accommodation for employees engaged in the war effort led to a change in business production and was almost immediately requisitioned by the Government. There are several examples of this in Marylebone, most notably the fine new town hall on Marylebone Road which had only just been completed in 1914, and was almost immediately requisitioned. On a smaller scale, the motor garage at 60-62 Little Welbeck Street was licensedto use part of the garage “for making and filling ampoules [capsules] with iodine and other medicaments”. Vacant premises at 74 Margaret Street were requisitioned by the Ministry of Munitions and used for making fuses in 1917. The landlords did not generally welcome these takeovers, but one war operation which had the wholehearted support of Lord Howard de Walden was the Marylebone War Hospital Supply Depot. Two properties on its estate – 2 Cavendish Square and 32 Queen Anne Street - were given over to this organisation which developed and produced all sorts of medical supplies including bandages, splints, blankets and all types of clothing for wounded soldiers, many recycled from domestic table linen. The workforce was voluntary and in fact paid a weekly subscription to the work. A reduced rent and annual donation was received from the Estate and the depots were visited by royalty including Queen Mary. Entry from The Howard de Walden Estate minute book allowing 32 Queen Anne Street to put up flags and a sign for the Marylebone War Hospital Supply Depot. 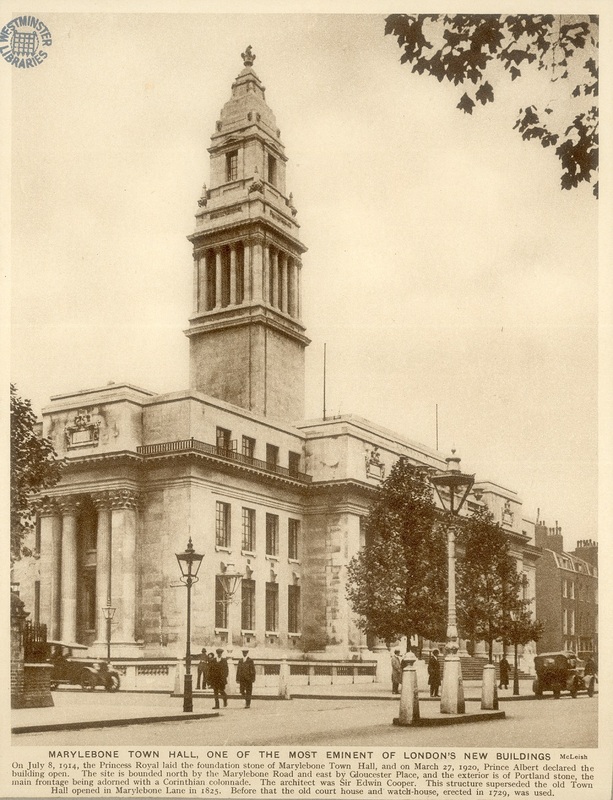 Marylebone Town Hall complete in 1914. 32 Queen Anne Street today.